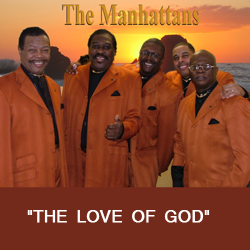 The Legendary GRAMMY Award Winning group The Manhattans deliver their first Gospel EP "The Love of God". Fronted by Vocalist Lee Williams, the EP features four songs written by Lee and two cover songs written by Sam Cooke. The group includes the late "Original" founding member Edward "Sonny" Bivins, Charles Hardy, Harsey Hemphill and Al Pasant. Let their music lift you up with those beautiful harmony vocals.